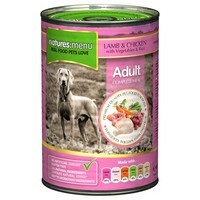 Natures Menu Adult Dog Food Cans (Lamb with Chicken) is a complete and balanced recipe prepared from whole cuts of Lamb, Chicken, fresh vegetables and wholegrain rice. Filled with top quality raw ingredients and steam cooked once to ensure all the goodness is locked into the recipe, each can is packed full of the essential nutrients needed to help maintain the health and vitality of your dog. Lamb is a complete protein and is packed with healthy Vitamin A, B Vitamins, and essential minerals. It also has a unique fat content in that over half the fat (around 60%) is the healthy unsaturated type which is actually good for the body.